Facing up to Global Warming: Eco Living, Ahoy Mate! The idea of living in an 8 by 20 foot steel box is enough to get you a few raised eyebrows and ‘are you mad?’ comments. But what if that box was spacious, homely, fully transportable, cheap, fire and flood proof, fully functional and designed to your own taste whilst keeping your ecological footprint to a minimum? If that sounds a bit better than maybe you are in the market for the latest green home, a converted shipping container. 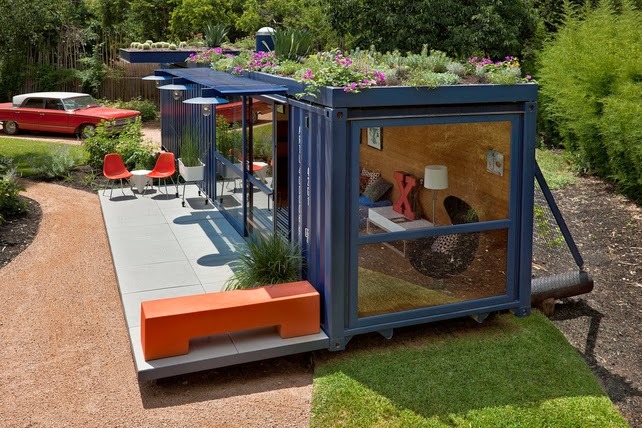 Taking reuse to a new level there has been an upsurge in the use of old, disused containers in to modern, quickly assembled and environmentally friendly homes throughout the globe. It has been estimated that there are up to 24 million containers that will never be used to transport cargo again and not only do these make great temporary homes for those in crisis (they were used as emergency accommodation for people after the 1988 earthquake in Armenia) they also make excellent contemporary office and living space (there’s even one down the road from me being used as stables!). One important aspect is that they are cheap to acquire in the first place. A quick scan of buyandsell.ie shows some for sale for as little as €1,600 + VAT. The fact that these homes are making use of a discarded material already makes them smart ecologically but many of them have incorporated features to make them that bit more sustainable. 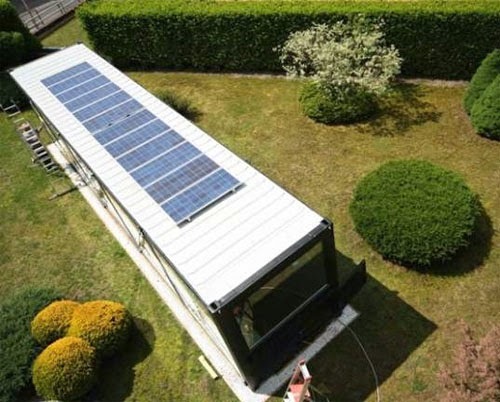 Some containers sport solar panels angled on the roof and others have small wind turbines and energy efficient windows. Another eco-friendly aspect it that it takes very little time for the setup of these homes which facilitates less disturbance to nature and also that they are transportable meaning they are not permanent in that area. Timber is also not required in the way that it usually is for many other house builds. One company has designed an ‘ecopod’ container to show just how sustainable you can make them. The ‘ecopod’ has recycled flooring, a solar powered fridge, a compostable toilet, wall sockets and 12v lighting that is powered by the roof mounted solar panel. If you think you need to compromise on the design aspect of the house in order to gain all these benefits think again. The containers can be piled high on top of one another, or fused together creating a manipulated masterpiece. They can be changed past the point of recognition or left in their original state bringing an urban renewal feel to the place there are also ones designed to disappear in to the natural background. The architectural possibilities are endless once you remember to think outside the box (a steel one in this case! ).